On Monday night, the Cambridge City Council voted to enact enhancements to our tree protection ordinance which will help decrease the loss to our tree canopy, and safeguard the valuable work that our Urban Forest Master Plan Task Force is doing until they come out with their formal recommendations in a few months. Until they do, the ordinance is applicable for up to one year, or until the recommendations of the Task Force are enacted, whichever comes first. You may be hearing about a tree “moratorium”, and even though this ordinance is designed to slow down tree-cutting to mitigate the negative affects of climate change, “moratorium” is not exactly the correct word. There are still avenues for property owners to remove trees over the next year, especially when trees are dead, dying, dangerous, or are negatively impacting their immediate surroundings. Under the updated ordinance, property owners may not remove a “significant tree” from their property, unless otherwise approved through a permitting process, and no permits shall be issued for one year. A “significant tree” is any tree that is 8″ in diameter or more at breast height (DBH). These trees are usually taken down by certified arborists and landscapers, as individual property owners seldom have the experience or tools to remove them on their own. Landscapers operating in the City of Cambridge are already being contacted by DPW, and will be made aware of the ordinance and proper permitting procedures so that they can advise their clients about the removal of significant trees. -Dead/dying trees: an independent arborist can certify that a tree has died or is dying and is a candidate for removal. They will need to complete a certification form after an inspection, which is standard procedure for an arborist. The “ISA Basic Tree Risk Assessment” form can be found here. -Dangerous trees: an independent arborist can certify that the condition of a tree makes it dangerous to its surroundings, such as trees with branches that are entangled in power lines, or trees with diseases that could spread. They will fill out the same ISA form (see above) which is also standard procedure. -Trees that “pose significant negative impacts to an existing adjacent structure”: the intent of this ordinance is to prohibit developers from removing large amounts of significant trees from our canopy, but existing homes shouldn’t be threatened by dangerous trees. This amendment allows homeowners to prevent potential damage to their homes, that dangerous trees could cause such as trees with roots growing into foundations, by making an exception for their removal after being approved by an arborist. -Overly dense canopy: in areas where several trees are tightly packed together, removing trees may be beneficial to the health of the entire canopy. Removing these trees would be allowed after inspection by a certified arborist. -Emergency removal: if a permit cannot be applied for beforehand because of an emergency situation, residents can apply for relief from the ordinance after the fact. One member of the public who spoke at Monday’s meeting shared that she had taken down already precarious trees in her yard ahead of the dangerously high winds that week. Had the ordinance been in affect at this time, she could have still taken down the trees and applied to the City for emergency relief. Other exemptions to this ordinance include: city park projects, all projects over 25,000 sq. ft. that have already been granted permits to move forward and 100% affordable housing projects, regardless of size. Because it takes decades for a significant tree to take formation and thrive, the City will levy financial penalties for violating this updated ordinance. If a significant tree is removed in violation of this updated ordinance, the replacement fee is the equivalent of “purchasing, planting, watering, and maintaining” the replacement tree for at least five years. For projects over 25,000 sq. ft under the current ordinance, that fee is approximately $800-$1,000 per inch diameter at breast height (DBH). These projects are being undertaken by typically large, commercial developers who have deeper pockets than a Cambridge homeowner and can afford to pay a fine of $8,000-$10,000 per tree into the City’s tree fund. I advocated strongly that the penalty for private owners would be far less. For those who qualify for a City of Cambridge residential tax exemption, the fee will be only 10% of the previously mentioned sums. There will be no fee for property owners who are on financial assistance. In addition to the fine to replace the tree, a resident who removes a significant tree in violation of the updated ordinance will owe a payment of no more than $300 per day until the fine is paid. All fines levied will go back into the City’s tree fund for the express purpose of increasing city owned trees to protect and grow the tree canopy in Cambridge. This ordinance takes effect on March 11, 2019, and the DPW is hard at work to inform property owners of its requirements. If you’ve found this post helpful, please share it with friends and neighbors, and reach out to my office at (617) 349-4263 or amallon@cambridgema.gov with any questions. The Office of Mayor Marc McGovern is proud to announce that members for the Mayor’s Arts Task Force, chaired by Councillor Alanna Mallon, have been selected. The Mayor’s Office received approximately 50 letters of interest highlighting each applicant’s unique perspective and passion for improving arts investment in Cambridge. Through a collaborative process between the Mayor, Councillor Mallon, and the Executive Director of the Cambridge Arts Council Jason Weeks, task force members, many of whom are renowned for their crafts, were selected to represent a diversity of disciplines and the socioeconomic diversity of our City. The Mayor’s Office is proud to announce the following appointees to the Mayor’s Arts Task force: Christopher Hope, founder of The Loop Lab; Ben Simon, EMF musician; David DeCelis, architect and Public Arts Commission; James Pierre, muralist and manager of the Community Arts Center’s Public Art Program; Kelly Sherman, working visual artist and innovation consultant; Olufolakemi Alalade, working visual artist as a member of MatriArts, a museum shop curated to promote African women’s arts and materials; Peter DiMuro, Executive Director of the Dance Complex; Olivia D’Ambrosio, Director of the Bridge Repertory Theater; Eryn Johnson, Executive Director of the Community Arts Center; A representative from Spaceus, an arts space rehab startup founded by Ellen Shakespear and Stephanie Lee; Martha McKenna, Director of the Creative Commons at Lesley University; Jero Nesson, Brickbottom Gallery; Kristina Latino, CEO of Cornerscape and music festival organizer; Sarah Gallop, Government Relations at MIT; Geeta Pradhan, Cambridge Community Foundation; and Michael Monestime, Executive Director of the Central Square Business Association. 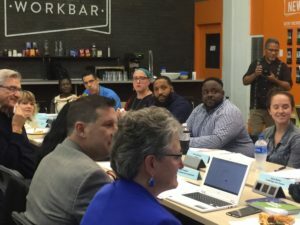 In addition, our arts community will be supported on the Task Force by City Staff, including representatives from the City Manager’s Office, Community Development Department, Office of Budget and Finance, Mayor’s Office Liaison Afiyah Harrigan, and Executive Director of the Arts Council Jason Weeks. The Mayor’s Arts Task Force meetings will be held monthly and will begin in October and conclude in June of 2019. In addition to our appointed members and City staff, the task force will welcome additional guest speakers to add their expertise on policy issues such as artist live/work space, diverse cultural programming, or funding sources. “I applaud Mayor McGovern, Councillor Mallon, and City Administration for recognizing the critical role that the arts play in the City, and for establishing an Arts Task Force as a means to hear directly from the community on need, and translate that information into tools and resources that will allow the arts and creative sector to remain local and thrive”, said Jason Weeks, the Executive Director of the Cambridge Arts Council. The goal of the task force is to present an arts plan with well-informed, actionable policy steps that will ensure our arts community thrives in Cambridge. Tonight I will be voting yes to move forward with the Inman Square redesign. It is not a decision I have come to lightly, or without doing my homework. I have talked with my neighbors at multiple community meetings as well as sitting with them one on one to hear their individual perspectives. I have met with City leadership over the past few weeks, and had detailed conversations with our City Manager, Traffic and Parking, the Assessors’ Department, and more, and asked tough questions about the proposed plan. I have talked with commuters of all kinds, whether they be drivers, cyclists or pedestrians. I have been in constant contact with the East Cambridge/Inman Square Business Association and individual small businesses to truly understand the impact on retail that a multi-year construction plan will have. And with regards to the Inman Square firehouse, I spent this past Friday night shadowing our Fire Department to see their equipment needs and challenges first-hand, and understand what firefighting looks like in 2018 so that I can support them in successfully serving our community. I want to respect the City’s community engagement process surrounding this redesign, particularly because the majority of it predates my time on the Council. But contrary to what has been said, not only is it okay to critique the process, especially when it yields a less than desirable outcome, I believe it is my job as a City Councillor. When I ran for office, people often asked me what set me apart from other candidates, and why, in such a crowded field, I was the one deserving of their support. My answer was always that I had the ability to truly listen to multiple perspectives, sit at the table with opposing stakeholders, bring people together, and have the difficult but productive conversations that lead to results. That’s why being a City Councillor is like putting together a puzzle. When I hear from constituents or advocacy groups, they are each presenting me with their piece of the puzzle, and through their lens, their piece is always the most important. But when all of these pieces are laid out on the table in front of me, they are equally important, and it’s my job to put them together and form the big picture. I have taken my Inman Square decision seriously, especially as the only Councillor who lives in this neighborhood. This issue represents the largest puzzle I’ve gotten yet: pedestrians, cyclists, businesses, neighbors, environmental activists, Public Safety officials, and the City all have their own pieces, and it’s my job to take a holistic approach and thoughtfully put them together. Projects like the Inman Square redesign require leadership that is methodical and thoughtful, and they require someone that’s willing to engage every stakeholder, ask tough questions and hold people accountable. I’m proud of the work I’ve done to do this. Since my comments last week, I have been able to address many of my concerns, and I hope, yours too. Retail will no doubt take a hit from the two year construction timeframe, and I have worked with our Assessors’ Office to spearhead an active engagement process, especially with our small businesses. City staff will be actively seeking out small business owners to offer tax abatements to ease cost burdens during construction. Our Economic Development Department will also be considering a number of “rapid response” methods to respond to unforeseen concerns during construction, and the City is committed to working on streamlining the permitting process for outdoor dining in anticipation of the new Velucci Plaza. Seniors and those with disabilities who regularly access the Health Alliance, Urgent Care, and the Inman Pharmacy have expressed concerns about the sidewalk design, and I have worked with the City to ensure not only ADA compliance, but to create a friendly environment for those who have impaired mobility. The loss of the large, mature trees in Velucci Park will have an adverse effect on the direct abutters of the park, whose residences used to benefit from the buffer between noise, traffic particulates (emissions), and general public view. I am working with Traffic and Parking and other City staff to add additional greenery to the remaining park that will protect those residences from increased exposure. And lastly, the size of the trees we plant in the new Velucci Plaza need to be large enough to recover our tree canopy in that area more quickly, and reduce the heat island effect. This plan is far from perfect. It was not the first choice of the neighborhood, or even the City, and to some groups, such as the cycling community, it was the last choice. Earlier and more popular alternatives such as “the peanut” were thrown out immediately due to the needs of the firehouse, but ironically at this very same meeting tonight, we are approving $575,000 for a new, smaller fire truck that’s more suited to urban environments. I won’t repeat my thoughts about the future of the Inman Square firehouse here (to read my previous statement, look here: https://alannamallon.org/inman-square-redesign/), but had a more holistic approach to this design been taken from the beginning, the City may not have been caught in the “this or nothing” situation we are in now. I ran on a platform of making streets safer, and I cannot justify a complete rejection of this plan, which does include protected bicycle infrastructure and shorter pedestrian walk times. But future projects cannot take this piecemeal, zero alternatives approach. As your City Councillor, I will always stay involved in a thoughtful, methodical way to ensure that the City approaches projects holistically in the future. As a resident of Inman Square for the past 14 years, I feel a special responsibility to my neighborhood to make the right decision regarding the proposed redesign. This is not a vote I am taking lightly. I’ve spent a lot of time thinking about this issue and talking with my neighbors at community meetings where I have listened to both concerns and excitement about the redesign. I can empathize with my neighbors who are skeptical of the plan, because as a member of the Inman Square community, I too feel the frustration of being presented with design options, only to be told that any alternatives to the current plan were impossible. So I share my neighbors’ concerns that impossible “alternatives” are not alternatives at all. But much has been made about the long process the City has undertaken to get to this final design, most of which pre-dates my time on the Council. I want to respect this, as it’s a process which has earned support for the plan from many of my neighbors. I have concerns about the current plan, but that does not mean I am in favor of the status quo. Inman Square requires improvements: first and foremost the addition of enhanced pedestrian crossings, protected bicycle infrastructure, as well as a complete revitalization of Velucci Park as an updated community space. It is abundantly clear that we need much better infrastructure for the 600 cyclists during the peak travel hour that move through Inman Square on their way to Kendall Square and Boston. But as I have been saying on Cambridge Street, good design is imperative. We’ve seen in other parts of the City how counter-intuitive bike infrastructure is either misused or not used at all. In a simpler design, we would create protected bike infrastructure in Inman Square that would allow cyclists to move quickly and safely on the same path that they follow now, which would maximize the already efficient path straight through the intersection that they have mapped out for themselves. We could even have separate bike lights that allow cyclists to get a head start on cars to avoid conflicts, especially at the intersection of Hampshire and Inman Street. Velucci Park has has long been neglected, but has the potential to be revived and turned into a real community meeting space. The existing mature trees provide greenspace and shade that would be greatly enhanced by tables, chairs, public art, or maybe even a water feature. While moving the plaza across the street comes with some benefits, any new trees added to the newly created plaza would need to provide the same high quality atmosphere. Although I don’t want to prioritize trees over safety, many of my neighbors who I have known and respected for years, feel a deeply personal connection to these trees after decades of caretaking, which I cannot trivialize or dismiss. I have had detailed conversations with City Officials who are involved in the redesign, and at this point, I am wondering if there are other, less impactful, less expensive ways to create a safer intersection. I talked at last Monday night’s meeting about the fire station that’s located in Inman Square, and I want to further explain my comments. This station has become a focal point and major factor of concern in the redesign due to the large vehicles entering and exiting the station on a regular basis. But the future of firefighting is changing, and so too may the future of this station. We had multiple conversations during the budget hearings about both the need for a new firehouse in the Alewife area while at the same time, the need for massive capital investments in our current firehouses, including the one in Inman Square which was built when horses were still being used. Firefighting is evolving rapidly, becoming less about firefighting (although this is still important!) and more about responding to attacks, being prepared for climate change events, and more. To back this up, the Council recently approved smaller fire equipment, boats, and even bicycles for our firefighters, and I wonder if this station could evolve to be for smaller vehicles and tactical units that would require less of a turning radius. This would have a major impact on any Inman Square redesign outcomes, and may open up several additional, true alternatives that may have been off the table before. If we are starting a two year, six million dollar project that will deeply impact our community, we need to be sure we are implementing the right solution. Over the next week, I am looking forward to continuing my detailed conversations with City Officials, my neighbors, and the Inman Square community about how to move forward with creating a safer, more manageable intersection. We all want a Square complete with safer pedestrian crossings, better bicycle infrastructure, and an upgraded public park that is deserving of the people who surround it. Too often I sit across the table from Section 8 tenants who have been denied housing because of source of income discrimination. At the mere mention of using a voucher, many low income tenants are denied the opportunity to fill out an application, denied apartment showings, have phone calls and emails go ignored by realtors, or are told outright that they are unable to rent a particular apartment. These discriminatory practices are illegal on the local, state, and federal level, but are often so difficult to enforce. In that moment, Section 8 holders often feel shocked, powerless, and alone; many of them may not even be aware this practice is illegal, because real estate applications and realtors themselves don’t inform tenants of their rights, so these incidents go unreported. Our Human Rights Commission is the body that is tasked with enforcing our local anti-discrimination ordinance, and for tonight’s Council meeting, I have co-sponsored an order with Councillors Siddiqui and Simmons which asks for information from the Commission. At last week’s Housing Committee meeting, I brought up the fact that we need more information regarding how many complaints the Commission has received, how many housing cases it has mediated, how many tenants were successful in challenging discriminatory practices, and how many mediation sessions, if any, were appealed to the Courts. This order is a small step, but it is the first of many to end this malicious practice. Eligible tenants are illegally being denied housing based solely on their source of income, and it’s exacerbating our housing crisis. Mobile vouchers are supposed to enable them to find market-rate housing, but instead, Section 8 tenants are often relegated to certain neighborhoods or buildings, end up sitting on the long wait list for an inclusionary unit, or are forced to leave Cambridge altogether. The Council needs to be empowered with information about these cases so that we can empower tenants and protect their rights. Our anti-discrimination ordinance helps maintain the diversity of our City, and the Council needs to do our part to work with the Human Rights Commission to enforce it if we want Cambridge to be a truly welcoming home to all. Last week, I introduced a policy order that would begin a pilot program to allow small businesses in Inman Square, the only Square not served by a major MBTA subway line, to issue temporary passes to a small number of employees. This is an especially pressing issue since the Inman Square Redesign construction project will result in an even greater loss of parking spots for both employees and patrons of businesses. I have supported these kinds of temporary parking programs in the past, such as when Councillors Kelley, Devereux, and Zondervan introduced their order to allow day parking for teachers at schools without parking lots. We all agree on promoting more sustainable forms of transit that are not single trips in cars, but we need to be equitable in our transit policy, and recognize that a one size fits all approach does not work in a diverse City. Many employees of small businesses or teachers cannot afford to live in Cambridge due to the high cost of living, and though our City itself is transit rich, we need to be asking ourselves “from where are people coming?” Not everyone who works in our City lives in an area that is accessible by the MBTA or another mode of public transit. The reality is that Inman Square lacks the kind of transit infrastructure needed for businesses to thrive, which is why the 2016 Retail Strategy report emphasized that parking in retail districts like this was “crucial to business success.” Employees are using the very parking that customers are supposed to use to patronize the stores – the meters out front, and employees are having to move their cars every two hours, wasting valuable time on the clock, and increasing the number of car trips made in the City each day. All of this negatively impacts the already fragile retail business economy. We can’t control the high cost of rent, we can’t control the fact that people are increasing using Amazon and other online venues to shop, but we can make the cost of doing business with the City of Cambridge a little less onerous, which goes a long way with our small businesses. Unfortunately my order was charter written last week, which means it did not come before the Council for a vote, and will appear on the agenda again this coming week. 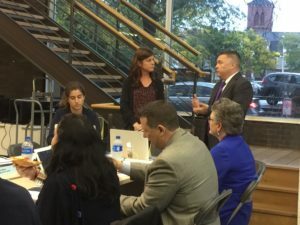 The Cambridge Day has coverage of the discussion that we had between the Council, Mayor, City Manager, and Director of Traffic and Parking regarding the proposal and how to best move forward. Transit inequity is a persistent problem in Cambridge, both for residents and non-resident employees alike, and I look forward to working with my colleagues on the Council and City Departments to find the best solution. What are the responsibilities of this group? 1. 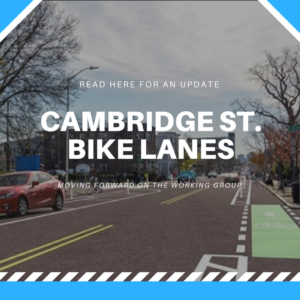 Provide a space to review recent bike safety projects, including Cambridge St. Brattle St., and sections of Massachusetts Ave. This review is about the *design* of, not the existence of the lanes. 2. Give input on how to improve the community process when moving forward with future bike lane projects. Who will be facilitating the working group? Our community has expressed interest in ending the “us vs. them” rhetoric that bike lanes have caused in the past. To help make progress on this, a 3rd party facilitator called the Consensus Building Institute, will be helping to guide the conversation. How will the group be formed? Who will be on it? The Consensus Building Institute will identify key stakeholder groups on this issue, and conduct 30-40 interviews with a representative sample of these stakeholder groups. Based on these interviews, CBI will make recommendations to the City Manager about appointments to the working group. 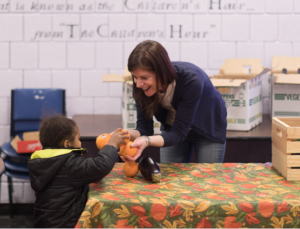 After the group is formed, CBI will use their neutral viewpoint to lead a constructive, productive conversation. When will the group be formed, and what is their timeline? The City is finalizing the contract with CBI now, and we should hear more about a timeline at the May 14th Council meeting. Once the working group is formed, expect their study and feedback process to last about 12 to 18 months. I want to thank everyone for their active engagement on this issue, but also your patience as we come together and ensure that this process is done right. I’m confident that the foundation laid by this group for a robust community conversation will be helpful as we move forward towards Cambridge’s Vision Zero goals.